The above info came from Kirbyfan106, and was edited by yours truly (contact me). The image came from Kirbyfan106. 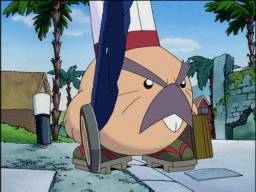 Chef Shitake is Kawasaki's mentor. He is a world-famous chef who loves to cook and loves to eat. A little while after Kirby came to Cappy Town, Nightmare Enterprises sent a monster named Popon disguised as Shitake to Dedede Castle. Kirby and the gang learned from Meta Knight that the Shitake-disguised monster was really Popon in disguise. Kirby ate Kawasaki's frying pan to become Cook Kirby and cooked the monster. Much later, a second Chef Shitake appeared, but this time it was the real Chef Shitake. Kirby, Tiff, Tuff, and Kawasaki attacked him and believed him to be Popon, but Shitake stated that he was not a monster, much to Kirby and the gang's delight. Shitake made his debut in his own cooking show, making people's food taste delicious. While he was doing that, Kirby and the gang discovered the recipe behind Shitake's tasty cusine: a gijira extract, which had the ability to make any kind of food taste hands-down declicious. After Kirby toppled a corncob monster sent by N.M.E. called Cobgoblin, Shitake said that he doesn't use the gijira extract himself and he was going to give it to Kawasaki to help him make better food, and that he doesn't mind his reputation being trashed before wandering off into the sunset.